McFarlane Toys is now exhibiting at the Sportcard and Memorabilia Spring Expo, today through May 2, 2004, at the Toronto International Centre, 6900 Airport Road, Mississauga, Ontario, Canada. The booth -- which is manned by Bob "Todd's Dad" McFarlane -- is located in the Corporate area and is displaying the latest McFarlane Toys lines including many hockey figures. 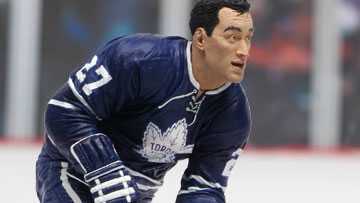 Of special note, we have debuted the recently announced NHL Legend Frank Mahovlich two-up prototype to the public. Click here to read all about the upcoming hockey legends action figure line. Additionally, Mahovlich -- as well as several other notable hockey players -- will be signing autographs during the show. Mahovlich was scheduled to stop by the McFarlane booth to see his figure prototype firsthand at around 6:15 p.m. EDT today. Show hours are today 1 p.m. - 10 p.m.; and Saturday and Sunday 10 a.m. - 6 p.m. Adults per day, $10; kids 6-12 $3 per day; preschool free; weekend pass $22. For more information, please go to www.sportcardexpo.com. If you're in the area -- or even if you're not -- stop by the show to meet Bob, see our display and be the first to check out the one-of-a-kind Frank Mahovlich two-up prototype. If you can't make the show, enjoy this photography of the two-up prototype.